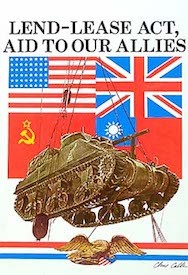 Words At War Episode 50 “Lend Lease: Weapon For Victory“ Released May 24, 1944. Words At War, the series that brings you radio versions of the leading war book another adaptation of an important war book, “Lend Lease: Weapon For Victory”. Words At War presents a thrilling and dramatic story, the story of Lend Lease. President Roosevelt sent a message to congress telling what Lend Lease has accomplished to date, explaining its cost and showing how it is helping us win the war. NBC in cooperation with the council on books in wartime brings you that same report by Edward Reilly Stettinius, Jr.